A pair of Augmented Reality safety glasses and cooling apparel designed specifically for hot Middle East climes are examples of the latest Personal Protection Equipment (PPE) on display at Intersec 2018 that will ensure the safety and health of regional workers. Italian safety equipment manufacturer Univet will introduce in the Middle East for the first time its VisionAR Smart Glasses, which integrate Sony's holographic waveguide technology into eye protection, allowing wearers to view real time data without looking away from what they’re doing. The 2017 Red Dot Award goggles display data on a holographic screen behind the right protective lens. The screen is clear so the wearer can see through it, while data on computers, tablets, and smartphones, can be accessed via WiFi or Bluetooth. Paola Portesi, CEO of Univet, said its VisionAR Smart Glasses are ideal for applications that require eye protection while processing large amounts of real time data, including in logistics and warehousing, manufacturing, rescue operations, medical, or oil & gas. Univet will be one of more than 1,300 exhibitors from 58 countries at Intersec 2018, the world’s leading trade fair for security, safety, and fire protection. The Italian company is among more than 200 exhibitors at the three-day event’s dedicated Safety & Health section, which is now officially supported by the Dubai Municipality. The government body’s backing comes as the UAE continues to step up efforts to raise awareness of worker welfare in industrial work environments. The UAE Ministry of Labour, in cooperation with municipalities, carried out approximately 5,000 health and safety site inspections across the country in 2016, and will increase inspections to at least 10,000 construction work sites by 2019. Eng. Redha Hassan Salman, Director of the Health & Safety Department at Dubai Municipality, said: “Due to its important and cooperative role in making Dubai a sustainable and safe city to live in, the Dubai Municipality is delighted to participate at Intersec as a key supporter. “The Municipality’s participation is represented by the Health and Safety Department as part of its commitment to the government, society, partners and clients to reinforce the concepts of responsibility at all levels. Intersec offers an important platform to connect with leading international and local experts, and plays a key role in providing the latest health and safety developments to Dubai and the region,” Eng. Salman stated. Ahmed Pauwels, CEO of Intersec’s organiser, Messe Frankfurt Middle East, added: “The continued positive evolution of safety culture in our work environment has been a welcome development. “It not only ensures a safer and healthier workplace, but also produces immense benefits for society in terms of increased productivity levels, lesser demands on health systems and an overall positive sentiment in society as a whole. Intersec will continue to contribute in creating awareness of workplace safety and health best practice, as part of our commitment to the region and its welfare,” he stated. Meanwhile, Cool Magic is another Intersec 2018 Safety & Health exhibitor answering the calls for better regional worker welfare and protection. The Indian manufacturer will launch its Cooling Apparel line comprising three technologies; Dry Evaporative Cooling, Hydra Evaporative Cooling and PCM (phase change material) oriented Cooling. Vikas Kumar Maan, CEO of Cool Magic, said its cooling apparel is ideal for the hottest Middle East climates: “The Middle East has the highest ambient temperatures for the majority of the year, and commuters, labourers, or sports teams are at risk of heat related illnesses,” he said. “Our cooling apparels and accessories are the perfect solution to prevent heat stress. Our technology is simple to use; it requires water to soak the product and thereby with slow evaporation of water, the wearer feels comfortable with natural cooling. It’s medically approved and cost effective. The technology not only helps users feel comfortable and safe, but also results in higher productivity rates thereby helping businesses,” added Maan. Other headline Safety & Health exhibitors at Intersec 2018 include Delta Plus, Derekduck, Honeywell, Master Lock, U Power, Midas Safety, Safety Jogger, and Salama Safety & Security. In its 20th anniversary edition, Intersec 2018 will occupy 60,000sqm across 13 halls, with the show’s other six sections covering Commercial Security, Fire & Rescue, Homeland Security & Policing, Perimeter & Physical Security, Cyber Security, and Smart Home & Building Automation. Other new developments include a Drones Pavilion and an indoor Drone Zone, while returning features include the Safety Design in Buildings Pavilion in the Fire & Rescue section, as well as an Outdoor Demonstration Zone of the latest fire rescue applications in action. 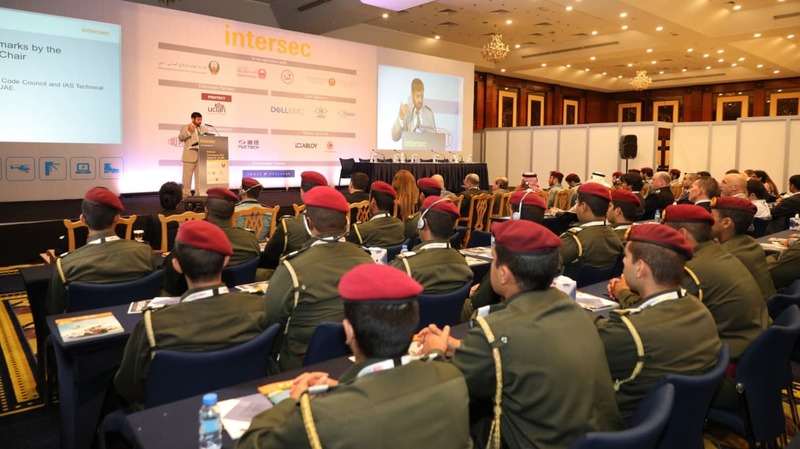 Intersec 2018 is held under the patronage of His Highness Sheikh Mansoor bin Mohammed bin Rashid Al Maktoum, and supported by the Dubai Police, Dubai Civil Defence, the Dubai Police Academy, the Security Industry Regulatory Agency (SIRA) and the Dubai Municipality.